Economic Journal which disseminates the research results in economics and interdisciplinary research outcomes. First year of publication: 1990. Published twice a year (June and December). It is an open access journal. The journal allow readers to read, download, copy, distribute, print, search, or link to the full texts of its articles and allow readers to use them for any other lawful purpose, with the permission of the publisher. The Journal aims to achieve Scopus indexing, Thomson Reuters indexing, and inclusion in other similar international database. 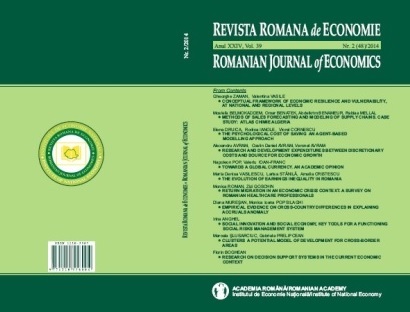 Status of the journal at present – the Journal is registered in National Authority List of the Romanian International Indexed Journals and promote effective policies measures and ways contributing to improving Romania's wellbeing challenges and sustainable growth perspective in the national and international context. The Journal is encouraging studies and papers devoted to the advancement of economics, eco-demography and resilience. At the same time is offering solid background for effective policy making decisions in economic and social fields, institutional building and cultural values incentives. A good part of published papers was and it still is dealt with issues, topics and challenges public-private partnership, good governance, anti-corruption fight, promotion of social justice, equity and inclusiveness as well as of friendly behavior to natural capital and eco-efficiency. Not less important is the concern on studying Romanian economy integration into EU, financial instruments and premises for joining Monetary Union. Desired future direction – the Journal intend to become a high quality publication — with continued improved prestige and reputation in Romania and worldwide, attracting foreign authors with international recognition and expertise in the field of economics. The Editor-in-Chief with his team is regularly reorganising thematic debate in order to identify new ways of quality improving and strengthening competitive position in the economic theory and practice. For the future, a more importance should be paid to aspects such as: RDI market peculiarities; the interplay between win-loss and win-win paradigms of economic international cooperation; market surveys and strategic management, FDI studies. The efforts of the Journal also are focused on the debates concerning the essence and methods of economic sciences, the experimental usage and improved predictive capacity based on new IT&C and disruptive technologies circular economy challanges. As a milestone for future activity of the Journal, better compatibility between the economic, social and environmental pillars of sustainable development should be approached in accordance with sustainability and complexity principles, as well as with business ethics, business cycle and anti-corruption fighting. A special attention is intended for measuring the evolution of the Journal rating inside and outside Romania. One of the most interesting direction of developing the editorial activity is related to the domain of risk management, vulnerability and threats mitigation or combating as a result of crisis processes and natural hazard impact. This license allow to download works and share them as long as the source is mentioned, but it can’t be changed in any way or use it for commercial purposes.